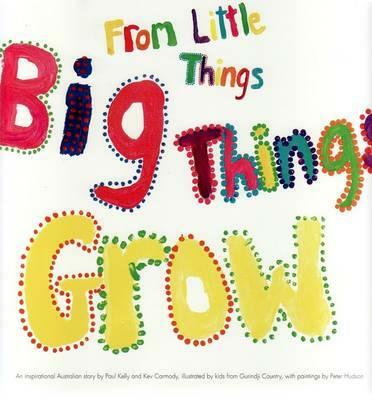 From Little Things Big Things Grow is a much loved Aussie song but it also tells of how the Gurindji people walked off Vestey's Wave Hill Cattle Station in 1966. This anthem for the Australian Land Rights Movement narrates how a simple action of protest, sparked by unfair wages, evolved into a battle for land rights long before the famous Mabo Native Title Revolution. Paul Kelly and Kev Carmody use simple words to tell of the injustices suffered by indigenous people for decades on outback properties. After working for nothing but rations on land that previously provided for all in abundance, the Gurindji people decided to make a stand. Vincent Lingiari, a quiet man, led his people for eight years in quiet protest. He withstood pressure from Vestey and federal politicians to accept small compensations. Vincent had the inner strength and vision to wait, and that waiting led to the return of ownership of some his people's land. From Little Things Big Things Grow gets under your skin. The jaunty, hopeful, persistent rhythm sticks in your mind. Peter Hudson's illustrations and those of the Gurindji children offer powerfully poignant points of view thus allowing children and adults to connect more deeply with this important historical event. 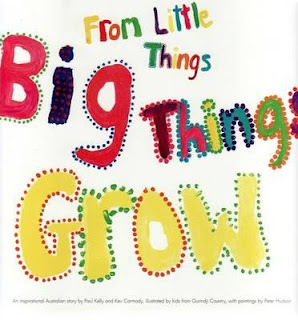 From Little Things Big Things Grow is no longer readily available in bookstores, but it's worth grabbing a copy if you get the chance. Mine holds pride of place next to Sister Heart in my small collection of classics about Australia's chequered early beginnings. Publisher: One Day Hill and Affirm Press, a not for profit project. No longer available in bookstores.